Sid Chavers is a legend in the craft of auto upholstery and throughout the hot rod scene. But it’s his latest project that may have the most profound impact on our industry. 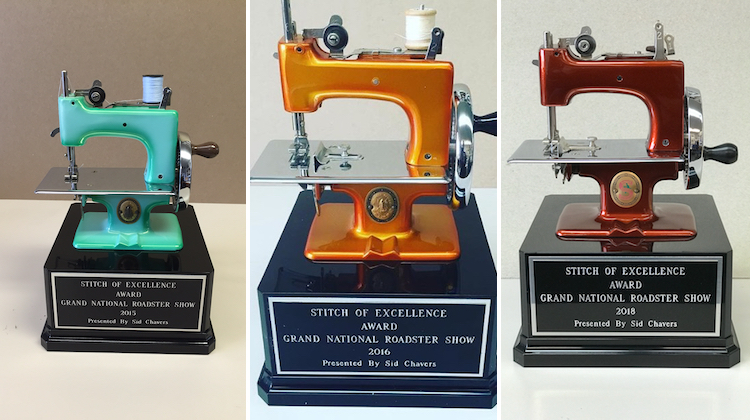 In partnership with the Grand National Roadster Show, Sid has launched the Stitch of Excellence Award to highlight the importance of our craft and honor other talented craftsmen. We recently spoke with Sid about the award, why he chose to create it and what he hopes it will achieve. How did you come up with the idea for the Stitch of Excellence Award? 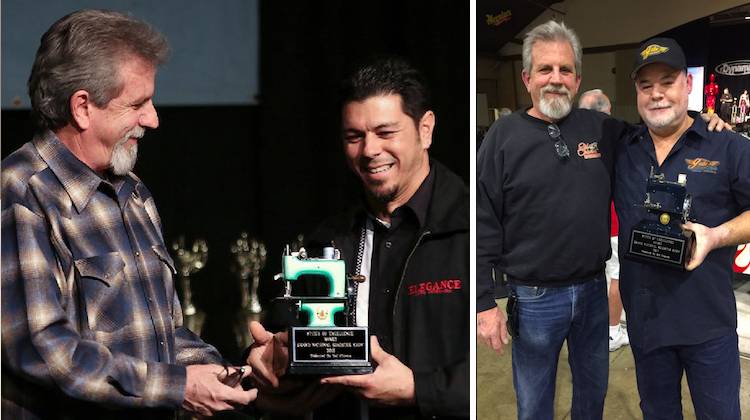 In September 2014, I approached John Buck, owner of the Grand National Roadster Show, about having a special Interior award. I offered to provide the trophy and pick the winner. Keep in mind this show now in Pomona was formally The Oakland Roadster Show that I started attending in the late 60’s. The show has many “special” awards and being a trim guy I thought it was time for the trimmer to get a little recognition. He had me commit to at least ten years, but I’m going to do it as long as I can. So you alone pick the winner? I usually get a little help from some other trimmers, but the final pick is mine. On what criteria do you judge the interiors? Is it difficult to pick the best interior? First, let me say I hate to use the word “best,” because as we know that is very subjective. I would say it’s more of a pick than a judged thing. That being said, I’m not going to pick something that’s not pretty damn nice. The trimmer gets a pretty bitchin’ little toy sewing machine from the 50’s, that I make into a trophy. It is an impressive trophy. How do you make it? First, I take the machine all apart and send the body to my good buddy Darryl Hollenbeck at Vintage Color Studio for custom paint. For those of you that don’t know, Darryl is a world-class painter and it’s pretty special to have him paint these for me every year. I then send some of the parts out for chrome plating and polishing, then reassemble. Keep in mind, these are working toy sewing machines. Next, the sewing machine is mounted on a heavy black base with an engraved plaque. 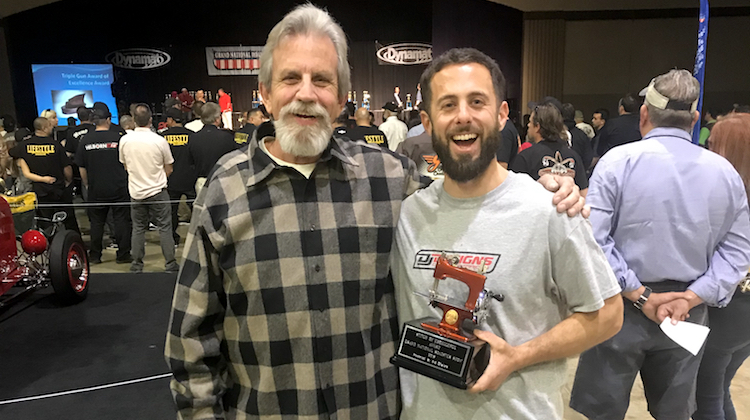 How is the award presented at the Grand National Roadster Show? The promoters present a few special awards before they give out the top awards. The winner is announced, comes up on stage and I give them the award personally. You present an award to the winning car’s owners, as well as the auto upholstery shop that did the work. Why is it important to you to also recognize the shop? I’m glad you asked. We all know that without the car owners we would all be doing something else. I have a plaque made for the car owner and they come up on stage also, but I thought it would be nice to have an award that goes to the guy or shop that actually did the job. Who won the Stitch of Excellence Award at the 2018 show? This year’s winner is a very talented young trimmer, Danny Williams of DJ Designs in San Francisco. And who were some of the past winners? The first award was handed out in 2015 to Mark Lopez of Elegance Auto Interiors. In 2016, Adam Banks from Rad Rods By Troy; 2017 Gabe Lopez of Gabe’s Custom Interiors; and 2018 was Danny Williams or DJ Designs. Do you hope this award will inspire other prestigious awards in our craft? Absolutely! Seems like this industry has been last on everyone’s minds for years. I have to say it is starting to change. There is some amazing talent out there these days and it’s starting to be recognized. It appears Sid’s efforts are already paying off. Last month, Mal Maher of NC Carpet Binding and Equipment announced the NC Auto Interior of the Year Award, which will be presented at the 2018 SEMA Show in Las Vegas. The auto upholstery industry is lucky to have such a dedicated and passionate leader as Sid. He truly is a living legend. In celebration of the Stitch of Excellence Award, Sid has graciously offered to give away five sets of his “Street Rod Interiors” Instructional DVDs. Each set includes three discs that provide detailed instruction on fabricating panels, seats and carpet. The complete set sells for $120. To win, simply leave a comment below our Instagram post about this article! We’ll pick five lucky winners! To learn more about Sid Chavers and his work, check out our article “10 Questions for Legendary Trimmer Sid Chavers.” You can also visit his website and follow him on Instagram. So often prize winning builds are made by the interior trimmer. 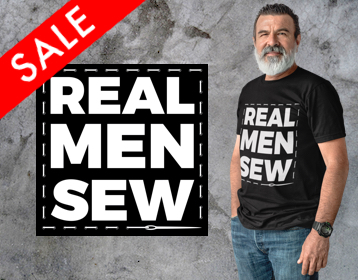 The builder gets all the kudos and recognition and the trimmer that did the “one off, knock it out of the ball park” stitching is left out. Thank you for doing the trophies Sid Chavers. Hopefully this will catch on at all the Pro’s Pick at the Goodguys and other shows and Cruise ins. I feel inspiration to carry this out.